Costs: $ 445 – A $ 250 deposit is required upon registration. Includes: Two full days packed with photography, lectures and tutorials. Meeting room rental fees. Does not include: Food/drinks. Accommodation. As old man winter is rattling on your front door and windows, howling for attention, and marking his visit by covering your driveway and patio with an “I was here” memento, you may well be inclined to hibernate until the weather is more conducive to photography. But don’t despair! Old man winter’s world is replete with wonderful photographic opportunities. Not only is the landscape ever changing and unique, the quality of winter’s light is particularly beautiful. I would like to invite you to an intense, yet fun, photography workshop this winter along the ever changing, mesmerizing shoreline and surface of Toronto’s Lake Ontario. The frozen landscape of Lake Ontario is one of my favourite locations worldwide to photograph and explore. 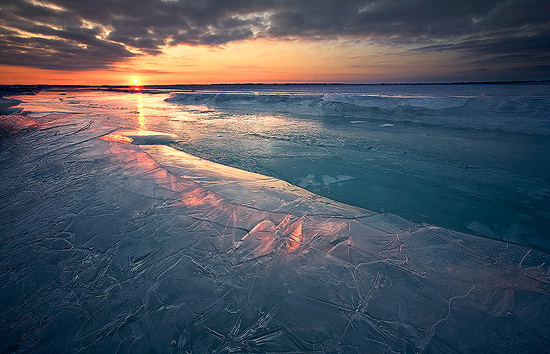 The possibilities are endless, and the beauty of the interplay between ice, snow and light exquisite and unique. Lake Ontario’s winter landscape doubtlessly has proven to be one of the most fruitful sources of powerful, unusual images for me. Please follow this link for a recent article of mine on winter photography. 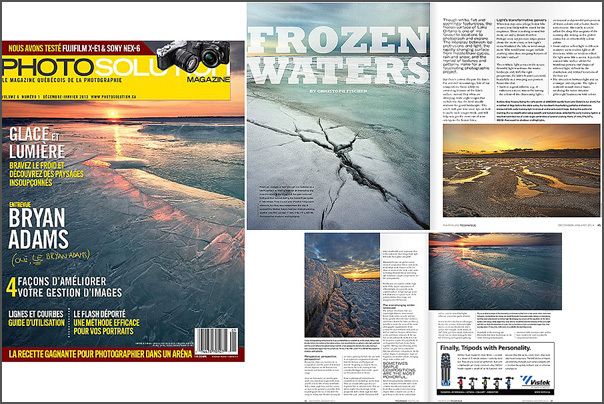 If you subscribe to Photolife or Photosolution I also have an article published in the 2012/2013 December/January issue, with a cover photo to boot :). Let me show you how to take advantage of the myriad photographic possibilities at the edge, and on the surface, of Lake Ontario. 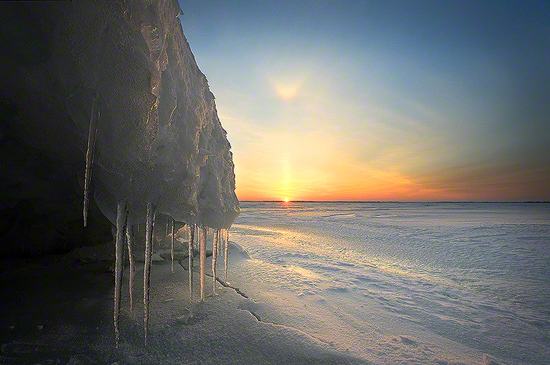 • Photographing ice formations and embankments illuminated by the rising sun. • Using your wide angle lens to distort the sense of scale for a unique perspective: Giant ice formations at your doorstep! • Photographing the myriad, ever changing textures and patterns of frozen waters and their interplay with light. • Preparing for, and dealing with, photographing in the extreme cold. • Shooting in RAW and editing your RAW files. • Understanding your exposure histogram and exposure bracketing. • Focus, Depth of Field and Sharpness. • Maximising your Depth of Field with Focal Blending. • Effective postprocessing skills, including exposure, focus and color temperature blending. We meet Friday at 7 pm for dinner at a local restaurant, where I will give you an overview of the workshop and where we have the chance to get to know one another. We spend the next 2 days along the shoreline and perhaps, if it is safe, on the surface of Lake Ontario, photographing the uniquely beautiful winter sunrises and sunset, and the golden hours of light that follow or proceed. Since winter is, well, winter, spending several hours outdoors in the cold can be very taxing. Therefore we will spend at most 3 hours in the cold during our photography sessions in the mornings and afternoons. The winter landscape of Lake Ontario is ever changing, and I will take you to areas I have identified as the most promising for rewarding photography. 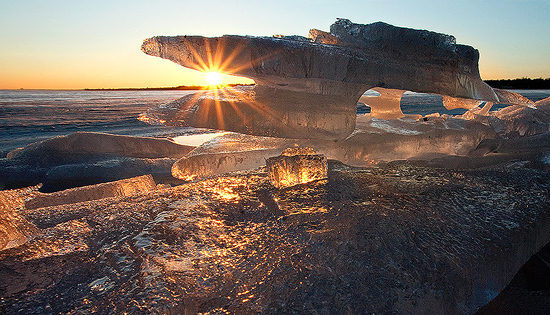 On our morning shoots we leave before dawn to photograph the spectacular interplay of the rising sun with snow and ice formations along the shoreline, or on the surface, of Lake Ontario. I will advise and assist you with identifying and framing those features of the icy landscape which interact compellingly with the morning sun. Following each morning shoot, we return to the indoors, not only to warm up, but also to enjoy a full breakfast. We then move to a meeting room I have rented where I will give presentations on processing images, developing a digital workflow, and the creative aspects of photography such as composition and developing a photographic vision, with a focus on winter landscapes. We will also spend time reviewing and critiquing images taken so far, so that you have a better chance of developing your photography as the workshop progresses. After lunch and a break, we set out for our late afternoon/sunset shoots, this time at a different location along Lake Ontario, which is better suited for sunsets. The winter landscape of Lake Ontario can change dramatically over short distances, and we likely will be photographing features which differ significantly from those we encountered at our morning location. After our sunset shoot we depart for a well deserved dinner and drinks before we return to our homes or hotel to rest in preparation for our second full day of winter photography . After lunch on the second day, there will be a session recapping what we have learnt during the workshop and a one on one review of each participant’s work. After our last sunset shoot, we depart for a celebratory farewell dinner, before we return to our homes, with many wonderful winter images in hand. • A quality, stable tripod – your tripod legs can’t be fused to the center column. • A quality tripod head which allows for easy adjustment of your camera’s position. No plastics! • Head lamp for walking at dawn and dusk/night. • Waterproof winter clothes – you will find yourself lying on the ice/snow while photographing. My ski pants and jacket usually do the trick. • Layers of thermal clothing below your outer shells. • Winter Boots with good grip- you will be standing on ice/snow for up to three hours. • Boot warmers and hand warmers – not a must but you may want to think about it. • Warm winter socks – but you still need sufficient room to move your toes. • Two sets of gloves – a well insulating, water proof outer shell and thinner inner liner gloves to be used when you adjust your camera settings.